Last month I went to visit my mum in France. 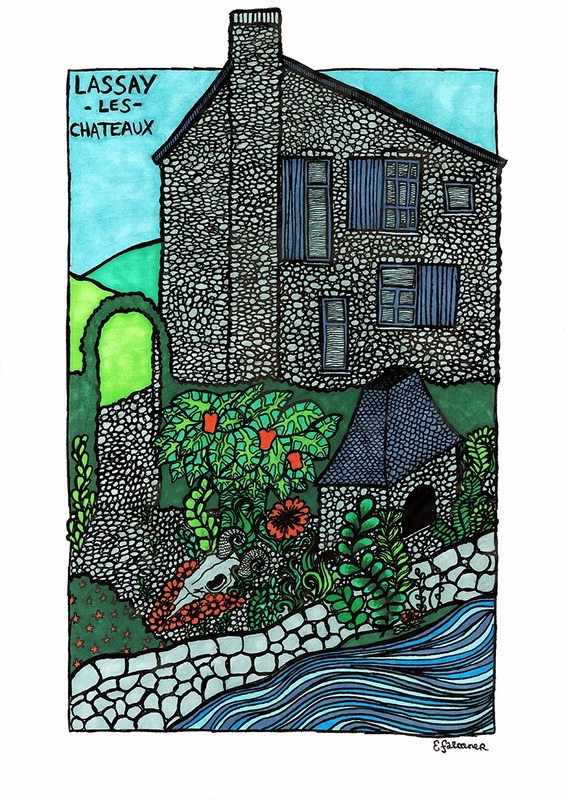 She lives just outside a small town called Lassay les Châteaux. It does indeed have several ruined castles. It’s on the Pays de la Loire / Normandy border, and most of the houses in town are old stone cottages. She considered buying one, but it was too damp. When people are thinking of France being cosmopolitan and chic, they are not thinking of rural Normandy. It’s a lot like Derbyshire, but without the mountains. The local cuisine is heavy on tripe, bacon and sour cream, served with teacups full of cider (there are two rival triperies in another nearby town). While I was there, I mostly ate my own weight in brioche and sour cream, and sat in the sun reading a book about the post-war political history of Europe. I took quite a lot of photos on film, so I’ll wait until I have those developed before writing more. I took some reference pictures of this old house by the river that took my fancy and made this drawing at the weekend. You couldn’t really see what was in the garden in real life, so as ever, I made it up for the drawing. There are prints available now on Society Six. If you order before the 11th of May you can get free postage.